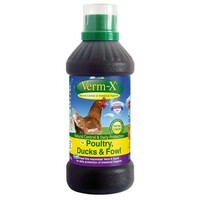 Verm-X Liquid for Poultry, Ducks and Fowl is an easy-to-use method of intestinal hygiene control that can be added to your birds normal drinking water or soaked into bread and fed directly. Gentle and supportive of your bird’s digestive system, Verm-X has been made using only natural ingredients, which as with all natural ingredients, may take a little while to become effective in your bird’s system. However, once established they will provide year round support and comfort. Furthermore, because the ingredients in Verm-X Liquid are complete natural, you can still continue to eat your hen's eggs whilst using the product. Add to your bird’s regular drinking water or soak in bread and feed directly. Feed half the amount to chicks between 2-4 months of age. The full amount can be fed from 4 months of age. Really easy to use and because it's herbal and natural I feel it's more gentle for the hens and in keeping with the 'organic' idea. Also good because you can still eat their eggs, even though you've dosed them. Very easy to use. I have 6 "garden" hens and squirt the required dosage into mashed potato (including boiled potato/veg peelings). They quickly gobble it up and their is no waste or mess. Great that you don't have to waste any eggs as with other wormer products. Definitely an essential item if you keep hens. Unpleasant smell but they don't seem to mind!